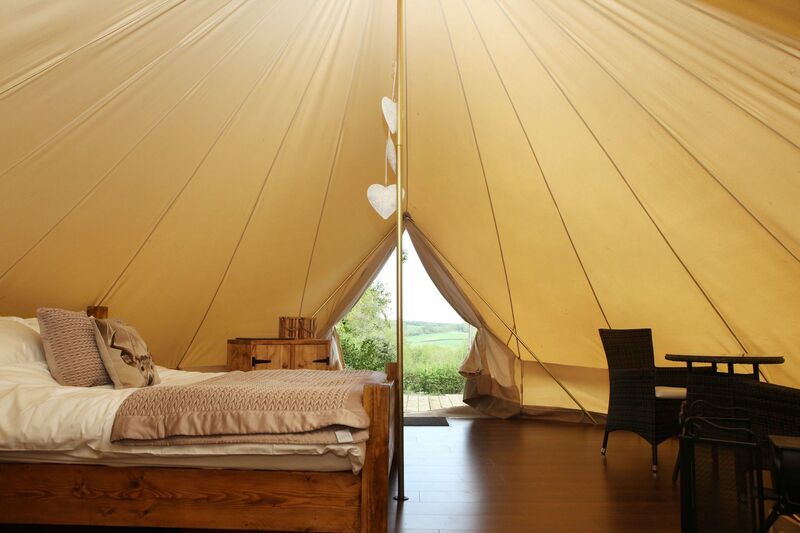 Dorset is one of the UK’s favourite glamping locations and it’s easy to see why. When it comes to glamping holidays, Dorset has it all: rolling countryside, a jaw-dropping coastline and a great choice of glamping accommodation. As a destination, we can’t recommend Dorset highly enough. It’s home to some of our favourite camping and glamping sites with scenery that’s nothing short of magnificent and plenty of things to do on days out too. People have been camping in Dorset for decades so it’s no surprise that it was one of the first places to really get going with glamping. 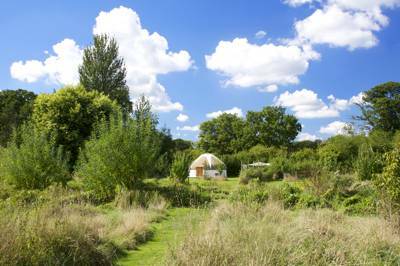 In such a special landscape, almost half of which is an Area of Outstanding Natural Beauty, low-impact camping and glamping are the greenest and best ways to stay. With pods, yurts, bell tents, airstream caravans and family-sized safari tents; on offer; there’s a glamping pad to suit all tastes. Some are on campsites that we’ve been using for years, some are on dedicated glamping-only sites and some are sited for seclusion. The thing they all have in common is that they’ve all been hand-picked by the experts at Cool Camping and given our seal of approval. Whether you’re looking for family glamping by the coast or a romantic rural retreat, if you want to combine camping with luxury, our selection of glampsites in Dorset is a great place to start. It's hard to pin down any one type of glamping accommodation that is particularly prevalent in Dorset and some might say that’s part of its appeal. Whether you’re after a bell tent that’s suitable for summer or a sturdy year-round pod, you'll find a glamping site that fills your need. The county’s busy camping and glamping scene means there’s a fantastic range of accommodation with levels of luxury and pricing to suit. If you’ve been glamping before, you might have a very specific idea of whether you prefer a tipi to a treehouse or a chalet to a shepherd's hut – but if you’re a first time glamper, our experience and expertise might help you decide. 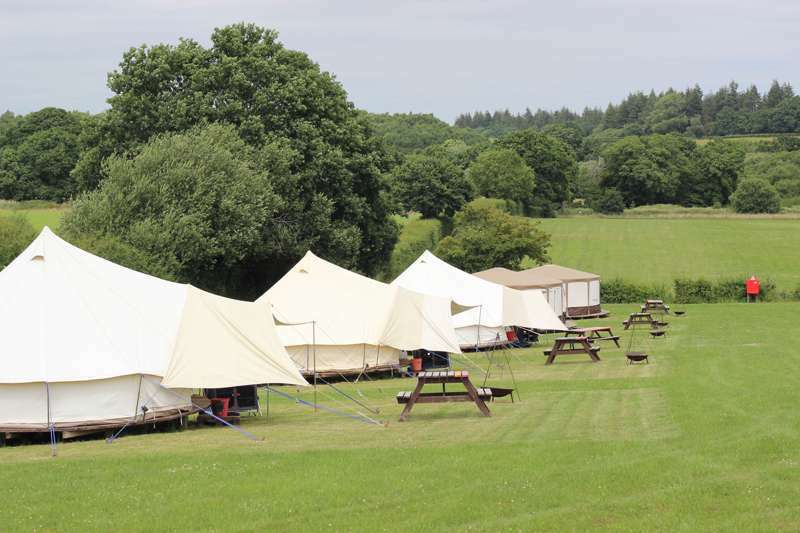 The simplest form of glamping and usually the most affordable can be found in pre-erected tents: bell tents have a classic appeal, yurts are usually a little sturdier and safari tents offer a tad more privacy with separate canvas bedrooms. Moving up the scale, shepherd's huts have a particular affinity with the surroundings in rural Dorset. They've been used here for generations – long before the word glamping even existed – and many glamping sites have converted old huts into modern-day masterpieces, complete with kitchens, proper beds and luxury en-suite facilities. Then there’s more elaborate treehouses and converted vehicles… we've found a little bit of everything in Dorset and across the UK. What's important to the Cool Camping team is that the whole site offers something special: from the friendly owners to the fresh towels in your bedroom. So, if you’re looking to go glamping in Dorset, you can be guaranteed that our recommendation – whether a rustic hut or a luxury safari tent – will be one of the best places to stay in the county. 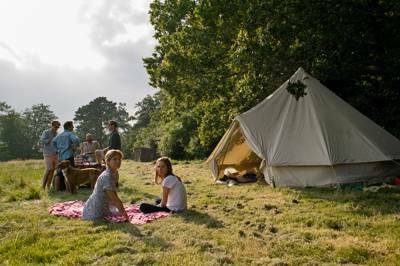 If you’re looking for a family-friendly holiday, we cannot recommend camping and glamping highly enough. Okay, okay – so we may be a little biased but, seriously, we know plenty of families whose kids prefer staying in a tent near Tunbridge Wells to touring Tuscany. If you’re asking yourself what it is about camping that is so exciting to kids, perhaps a spot of family-friendly glamping will remind you of its charms. Glamping is camping with bells on and the perfect way to try camping for the first time or to reacquaint yourself with its pleasures. If your kids are keen to camp, but you’re not so sure (or vice versa) then glamping is the perfect halfway house offering all the pleasures of life in the great outdoors with none of the hassle. You won’t have to pitch a tent and, if you don’t want to ‘go without’ on your holiday, you don’t have to. These days you can go glamping and sleep in proper beds with luxury linens, you can have an en-suite bathroom and a plug socket for the hair straighteners – if you want one. It’s our experience that kids love the adventure of sleeping under canvas or in a glamping pad with necessarily pint-sized proportions. Step in to a shepherd’s hut and it’s like it’s been made for them. But most of the adventure, for kids and adults alike, is in the great outdoors of course. On site, kids can play outside all day and enjoy the relative freedom that campsite life allows – running free, making friends, building dens, bug hunting, pond dipping and more. Cooking and eating al fresco, watching the stars come out and toasting marshmallows on the campfire all add to the fun. 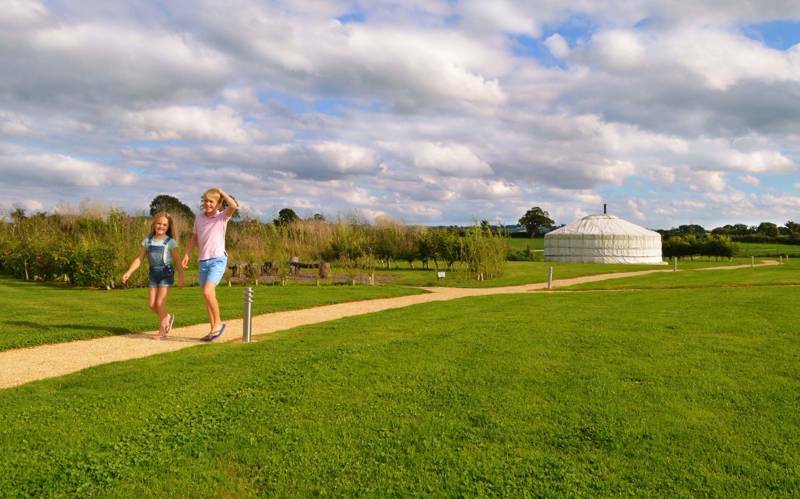 If you’ve got time for anything else, you’ll want to know if there are family-friendly attractions near your glamping site. When it comes to Dorset, you can rest assured. The 95 miles of Jurassic Coastline offers all the activity you’ll need with fossil-strewn beaches where you can treasure-hunt all day, shallow waters for swimming in some of its bays and all the fun of the fair in the seaside resorts of Swanage, Weymouth and Lyme Regis. There’s also Corfe Castle, Monkey World Ape Rescue Centre, the Swanage Railway and a museum in virtually every town with activities laid-on for kids too. As well as being fantastic for a family-friendly holiday, there’s plenty of opportunity for adults-only glamping in Dorset too – whether you’re looking for a romantic holiday or a trip for friends. Look out for adults-only glamping sites if you want a break from the kids but also consider booking your glamping break for mid-week or weekends outside of the school holidays. Glamping sites with just one or two shepherd’s huts or glamping pads can be great for romantic breaks or groups of friends who expect to be staying up late. With candles, campfire and cosy accommodation, glamping is a great time to catch up and chill out away from the distractions of modern life. And if it’s romance you’re after, Dorset has history with Jane Austen setting the part of her novel Persuasion, where love is rekindled, in seaside Lyme Regis. Dorset is full of days out and things to do that are perfect for adults too. The start of the South West Coast Path national trail is in Studland on the Dorset coast and if you’re a serious walker, you can get some miles under the belt on this well-signposted route. The trail takes you past some of Dorset’s best-known sites including Lulworth Cove and Durdle Door and close to village pubs which are perfect for pit stops. 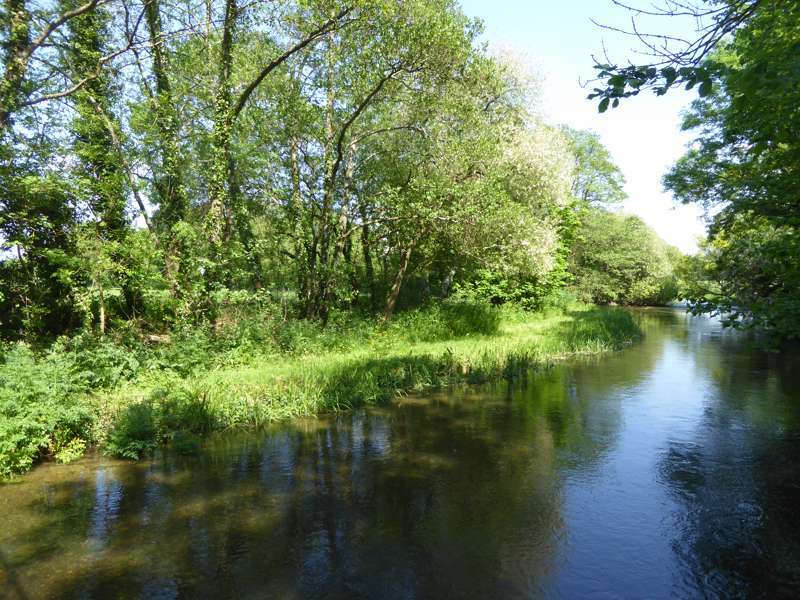 Inland there are castles and heritage sites to explore including Thomas Hardy’s Cottage. Foodies will love a trip to Hugh Fearnley Whittingstall’s River Cottage too where you can feast on local produce or even sign up to a cookery class. When it comes to the history of Dorset the famous Jurassic Coast is the first place you should start. The awe-inspiring, dramatic cliffs, formed some 185-million years ago, tell a tale of bygone eras when dinosaurs roamed the earth. The Dorset Tourist Board are always quick to claim they’re the home of the ‘real’ Jurassic Park and, while the likelihood of getting chased by a T-Rex is low, there’s a very decent chance of finding prehistoric fossils and gigantic footprints on the beaches. Kimmeridge Bay, Charmouth and Lyme Regis are all good places to head out on a fossil-finding mission and, if you need a little help from the experts, there are plenty of guided walks throughout the year. For dramatic and iconic rock formations, you might like to visit Old Harry Rocks near Studland or Durdle Door and Lulworth Cove. Back inland, history continues to come thick and fast, with the likes of Cerne Abbas – where a chalky, naked, club-wielding giant is carved into the hillside – and the largest hill fort in all of Europe at Maiden Castle – it’s the size of 50 football pitches! There’s the medieval St Catherine’s Chapel at Abbotsbury, where you can soak up the breath-taking Dorset views and an eclectic range of castles and country houses all across the county. Plus, you can indulge in Dorset’s rich literary heritage – this is, after all, Thomas Hardy’s fictional Wessex, the fabled backdrop for novel after novel, with many of his grassy vales, pebbly beaches and sheep-dotted heaths unchanged to this day – not to mention his former home, now open as a tourist attraction thanks to the National Trust. More recently, Dorset provided inspiration for the gripping Broadchurch television series. Creator and writer, Chris Chibnall, claims he wrote the series as a “love letter” to the Jurassic Coast. It’s a love that we at Cool Camping are happy to share. If your idea of glamping in Dorset is all about being by the seaside, you’ll want to choose one of our glamping sites with easy access to the beach. Thankfully there are plenty of them: some are on cliff tops with sea views and a scramble down to a cove, some are within reach of Dorset’s well-loved seaside resorts and some are steps from the sand or shingle. But wherever you choose to go glamping in Dorset, you’re never too far from the sea and who can resist the lure of a seaside resort? Buckets and spades, fish and chips and Punch and Judy shows have been adding to the attractiveness of a holiday by the sea ever since the Victorians invented them. Starting in the east of Dorset, bustling Bournemouth is a big-hitter in terms of attractions. It’s got miles of golden sands, a pier, an aquarium, fun fair rides, amusements and a zip line. Just along the coast is Poole, world famous for its harbour, and more quayside than seaside with watersports and ferries ready to whisk you across to Brownsea Island, the birthplace of the scouts, and the Purbeck peninsula where the Jurassic Coast begins. 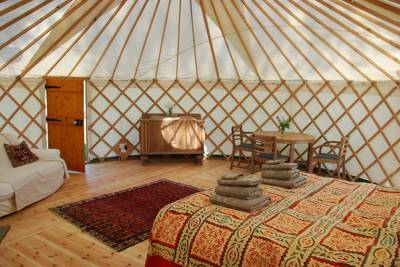 Choose glamping near Swanage for a place on Purbeck itself. It makes a convenient base as the gateway to the Jurassic Coast with all the fun of a seaside resort thanks to its Blue Flag beach, watersports, shops and eateries. Some of the best and wildest stretches of the Dorset coast are on the Purbeck peninsula, south and west of Swanage, and the next resort town is much-larger Weymouth. Midway along the coast, it's a great place to glamp if you want to explore all that Dorset has to offer. It has a modern town centre and a beach-hut lined seashore with traditional entertainment from donkey rides to Punch and Judy shows. Lyme Regis, in the far west of the county on the border with Devon, is a smaller and more genteel seaside resort. Its historic buildings line the streets down to The Cobb, an age-old harbour wall. It has a café-lined beach that’s perfect for paddling, swimming and sandcastle-building. Hunt for fossils beneath the mighty cliffs of the Jurassic Coast. Walk the clifftop footpath and enjoy the views of Old Harry Rocks and Durdle Door. Hike to St Catherine's Chapel for some of the best views in the county. Eat the freshest fish and chips at Weymouth harbour. Take a day-trip into Poole and catch the ferry out to Brownsea Island. Explore the ruins of Corfe Castle. Pick up some fresh fish to cook on your campfire. Relax on your glamping site with a copy of Jane Austen’s Persuasion. Walk along The Cobb in historic Lyme Regis. Glamping sites in Dorset, glampsites in Dorset, glamping in dorset at Glamping in Dorset, Get outdoors and discover the best Dorset glamping with this handpicked collection from the authors of the best-selling Glamping Getaways guidebook, including pods, shepherd’s huts, safari tents, yurts, bell tents and more.